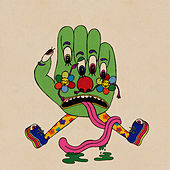 After 2012's expansive America, scored for full ensemble and inspired by a whole dang continent, Baltimore's Dan Deacon takes a step backwards with Gliss Riffer, returning to the solo electronic production of early albums like Spiderman of the Rings. Most of the album is a riot of dizzy electro-pop, abuzz with fizzy synths and chanted choruses. But the closing "Take It to the Max" and "Steely Blues" detour through contemporary composition and electro-acoustic music to brain-bending effect. The whole thing is exhilarating.